Increase Your Self Defense Skills! The understanding Neurological Pressure Point Knockouts is critical for successful self defense in our world today! Are you aware that there are 3 different type of knockouts? Let’s now take a look at these 3 knockout types. A concussion is caused by blunt trauma to the head resulting in bruising or damage to one or more areas of the brain. This is the result of the brain as it collides with the inside of the skull. A concussion can also be caused by heavy impact to the skull. A martial arts strike, a serious fall, car accident are possible causes. In many cases a concussion can lead to permanent paralysis as well as death. Neurological knockouts are caused by a short circuit, overload, or imbalance in the central nervous system. This is involving both the parasympathetic and sympathetic nervous systems of the brain. Kyusho Jitsu techniques, by striking pressure point can cause this to happen also. These are also known as a neurological pressure point knockouts. Neurological knockouts may also be caused by extreme stress, high emotions, shock, or extreme trauma to any area of the body. An example is a broken or crushed limb. This kind of knockout can also be chemically induced with excessive use of alcohol, toxins, and even allergies. A cardio / respiratory knockout is caused by limiting the oxygen supply to the brain. This can be caused by choking or strangulation involving the air way, or the flow of blood to the brain. They can also be caused by impact to veins or arteries causing a disruption in the flow of blood. Another cause can be by dislodging plaque from the arterial walls causing clots. This is one of the reasons why we tend not to do KO’s on persons over the age of 40. There are also other causes such as stroke, cardio vascular disease and respiratory ailments such as asthma which can also be triggered neurologically. The understanding that blunt trauma will not always stop an attacker is critical! The solution is simple, that is understanding Neurological Pressure Point Knockouts! The Gray’s Anatomy of Knockouts! In this new eBook I will break down the pressure points you can use in self defense. I will also address how to strike each point, and why they can be used or one hit knockouts. 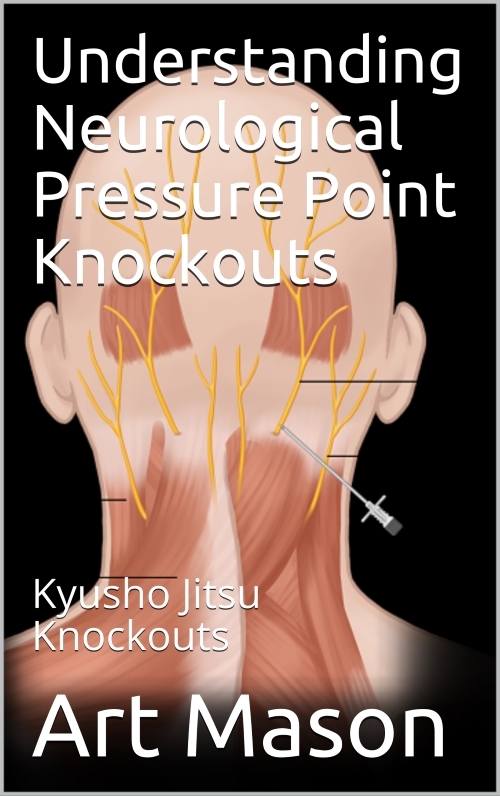 This eBook looks as neurological pressure point knockouts from both the Kyusho Jitsu aspect, as well as a medical aspect.